Kris Commons hammered home an unstoppable free-kick only three minutes from time as Hibs saw out 2016 with a much needed victory. 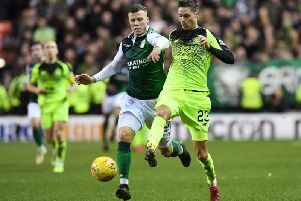 Neil Lennon's side had looked destined for a third 1-1 draw in succession until Falkirk defender Peter Grant fouled Hibs substitute Martin Boyle 20 yards out and dead centre of the Bairns penalty area. Commons was faced with virtually every Falkirk player in front of him but he thundered the ball through the wall for his first Hibs goal. Earlier Craig Sibbald had put Falkirk ahead only for Jason Cummings, with his tenth goal of the season, to level just 90 seconds later. Falkirk made their early pressure tell when Aaron Muirhead swept in a low cross from the right which was met by Scott Shepherd who saw his close-range shot come off Ross Laidlaw's left hand post, the ball falling for Sibbald who saw his effort saved by the Hibs goalkeeper. But as the ball spiralled into the air Sibbald got a second bite, hooking it home from a couple of yards out. However, the Bairns lead lasted just 90 seconds, Commons threading the ball through for Cummings to slot into the bottom corner of the net from just inside the penalty area. Falkirk almost restored their lead when Shepherd got up to knock Tony Gallacher's deep cross down into the path of John Baird who took it on the half-volley but sent the ball wide. Hibs should have got their noses in front six minutes into the second half when Grant Holt got his head to Cummings' cross, directing the ball towards Commons who, in attempting to nod it back over Falkirk goalkeeper Danny Rogrers, succeeded only in putting it onto the roof of the net. Falkirk substitute Bob McHugh had a glorious chance to win it for the Bairns five minutes from time as he held off Paul Hanlon to get on the end of Gallacher's raking through ball but with only Laidlaw to beat he fired wide. But Commons did exactly that two minutes later, thundering an unstoppable free-kick from 20 yards past Rogers after Peter Grant had brought down substitute Martin Boyle. Falkirk: Rogers, Muirhead, Gasparotto, Grant, Gallacher, Hippolyte, Taiwo, Kerr, Sibbald, Baird (McHugh 67), Shepherd Miller 74). Substitutes not used: Mehmet, Leahy, Rankin, raigen. Hibs: Laidlaw, Gray, McGregor, Hanlon, Stevenson, Martin, McGeouch, Shinnie, Commons, Cummings, Holt (Graham 82). Substitutes not used: Virtanen, Fontaine, Bartley, Boyle, Keatings, Forster.